Parents put their trust in school nurses to be there for their children, some of which have special needs. Since the Gallup Poll began ranking “most trusted professions” in 1999, nurses have placed No. 1 every year with the exception of 2001, when firefighters took the spot after 9/11. People have depended on and trusted nurses through life’s most intimate moments: birth and dying and times in between of injury and sickness. And parents trust that nurses will be there when needed while their child is in school. 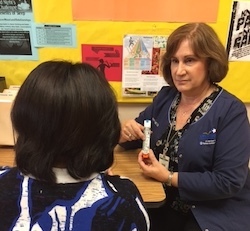 Covington Middle School RN Sandra Stehling teaches a school staff member how to use the EpiPen™. Austin Independent School District parents received news at the beginning of the school year that while the number of health assistants would be almost doubled, the number of registered nurses would be reduced in elementary schools. Parent testimony to school board members at the Aug. 28 meeting reflected their shock, anger and sense of betrayal. It also revealed a misconception of just who was staffing the “nurse’s room” at the schools. But first, a little history. In the summer of 1995, new AISD Superintendent Jim Fox did what he had done in Georgia: he threw all registered nurses out of the schools. Too expensive, he said. All hell broke loose. School staff didn’t feel comfortable caring for sick or injured children. Pediatricians were up in arms that without an RN to assess problems, they would be inundated with needless calls to their offices from school staff. Parents were beside themselves. The community came to the rescue. The Seton health system created a large stakeholder task force, on which I served, and a partnership was born between the former Children’s Hospital of Austin and AISD to provide school health services, the first such hospital/school district partnership in the country. The model introduced student health assistants trained by school nurses. An RN and assistant were assigned to each of the schools, but with limited resources, they shared schools. Parents, teachers and school staff were greatly relieved and liked the new program. Fast-forward 22 years to now. With a student population of almost 87,000, Seton made changes to the program. A non-controversial change was the addition of virtual care technology, which promises to greatly increase efficiency and quality. Cameras installed on health-room computers in each of the district’s 130 schools allow assistants to instantly connect virtually with the nurse when needed and on some campuses with the child’s pediatrician’s office. Before, RNs in shared schools had to rely solely on verbal descriptions via telephone and if needed, drive through this dreadfully congested town to see the child. The reduction of nurses, in whom parents place their full trust, is what caused the explosive reaction from parents. And it didn’t help that a public hearing wasn’t held before the changes were announced, which Seton admits was a mistake. Seton’s Kristi Henderson, an architect of the school health program and also a nurse, was taken aback by the community’s reaction and set about to make it right. She visited schools and met with nurses, teachers, principals and parents. One thing she learned is that many parents never realized that health assistants were on staff. Just as in hospitals, assistants help RNs by performing lower-level tasks. In response to the input she received, rather than reducing nurses, Seton is hiring 33 registered nurses. With those numbers, all of AISD’s large (greater than 700 students) schools will have an RN in the health room all day for the first time. That’s many more nurses than the program has ever had and a 33-percent increase from last year. All school districts across the country have many students with chronic health conditions, many life-threatening, which require complex and frequent intervention. RNs write individualized protocols for each student with a condition that may become emergent, conditions such as severe food allergy, diabetes, asthma and epilepsy. RNs case-manage medically fragile students. RNs meet with parents and school staff. RNs conduct health teaching in the classrooms. RNs provide trainings for health assistants, teachers and other school staff to learn procedures such as gastrostomy feedings, urinary catheterizations, giving epinephrine and insulin and much, much more. Parents put their trust in school nurses to be there for their children, many with special needs. Maybe some day every public-school campus will have the security of a trusted, expert registered nurse on site all day. But not today.